Welcome back to school everyone, hope you enjoyed your first day back at school and had fun over the holidays - and read some great books too of course. 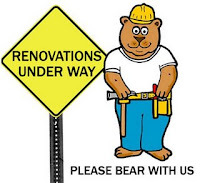 The library is still closed for now as improvements have not yet been finished. We hope you don't mind having to wait a week or so to use the library and look forward to seeing you back there again soon when things are all done. In the meantime you can peep through the library windows and see whats happening inside (not much just yet!) and of course you can keep checking out the library blog for updates and interesting book sites, videos, book and author posts and anything else I come across that I think you might find interesting or fun.